For several years we have been touting the benefits of a fuel pulse damper (FPD) in fuel injected systems. Formerly only seen on OEM fuel systems, Radium Engineering was the first to introduce the FPD to the high performance aftermarket. However, most OEM-level FPDs are not ideal for use in high performance, high pressure fuel systems. An FPD is used in fuel injection systems to attenuate pressure pulsations generated by the fuel pump operating, the regulator opening/closing and by the injectors opening/closing. These hydraulic pulses can cause an undesirable noise, which can be transmitted to the passenger compartment (SAE J1862 10/15/2012). These pulsations can be large enough to hear and feel, but are often undetectable with a liquid-filled analog mechanical fuel pressure gauge because they happen so quickly. The fuel pulse damper works by allowing the volume of the fuel system to change slightly to absorb the pulses. This is done with a spring loaded flexible diaphragm. How do I know if I need a Pulse Damper? Fuel system pulsations can have an undesirable effect on cabin NVH (noise vibration and harshness) by causing fuel line "knocking". They can also contribute to mysterious lean spots in the fuel delivery. These are often the result of the hydraulic pulses acting in harmonic resonance with the injectors opening and closing. This issue can be aggrivated by high-flowing aftermarket injectors. In some vehicles, these lean spots can result in stumbling during acceleration, commonly occuring in the 3k-5k RPM range. If you are experiencing either of these issues, a damper could be a good solution. A fuel system that is comprised of mostly hard tubing will be more susceptible to knocking and a pulse issues than a system with a combination of hard tubing and rubber hose. When a vehicle is modified with high flow injectors and uses high fuel pressures, fuel pulsations can become an issue. Most tuners are not concerned with the noise, but rather with the performance and seek constant, reliable fuel delivery throughout the RPM range in order to dial in the EFI tuning. If everything is running great, and fuel delivery is spot-on and there are no fuel line noises, then you DO NOT need to add a damper to the system. A damper IS NOT magical cure-all for any fuel system problem or tuning issue. Which Damper do I need? Where do I install a damper? How many dampers do I need? When it comes time to selecting a damper, there are two decision that have to be made: tall or short version and connection type. Choosing between FPD-XR(tall) and FPD-R(short) is done based on fuel pressure, so it is imperative that the static (base) and maximum fuel pressures are known. Use the guide on the PRODUCT PAGE to select the damper to use. Also make sure you checking for room where you plan to mount the damper the XR is quite a bit taller than the R version. If your fuel rail has a female 8AN ORB or 3/8NPT port, select a compatible damper. If the fuel rail does NOT have a compatible port, then an in-line damper should be used. The inline damper should be located on the fuel feed line, within the vicinity of the fuel rail. If an engine has two fuel rails (V8, V6, H4, etc) it is not always necessary to install a damper on each rail. However, testing will have to be done to verify. In most cases a single damper is sufficient. Most OEMs will utilize some method to attenuate the pressure pulsations. Manufacturers never prefer to add cost to a vehicle. In some cases, instead of a fuel pulse damper, you may find some other methods employed to attenuate the noise. These measures can include rectangular cross-section fuel rails with a carefully tuned width and height, strategic location of the fuel pressure regulator, fuel lines mounted to the body using vibration isolating mounts, etc. For some OEMs, the noise is not an issue and there are no negative effects on fuel delivery, so no measure is taken to address fuel pulsations. 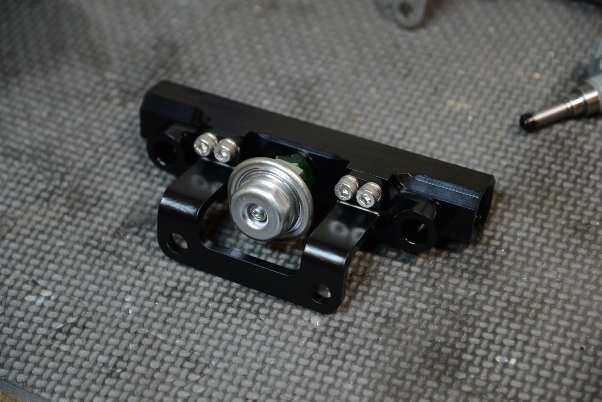 We have always realized the importance of the pulse dampers and have designed all of our fuel rails to accept them, whether it is the OEM damper that came on the engine (see picture below), or our standard OEM-style damper that uses universal threads. While these standard FPDs have worked for many applications, it comes up short in others. Most boosted engines use a pressure referenced regulator where fuel pressure rises 1:1 as boost pressure rises. If the damper is tuned from the factory for a specific single fuel pressure, then it becomes ineffective as fuel pressure rises outside of the normal range. 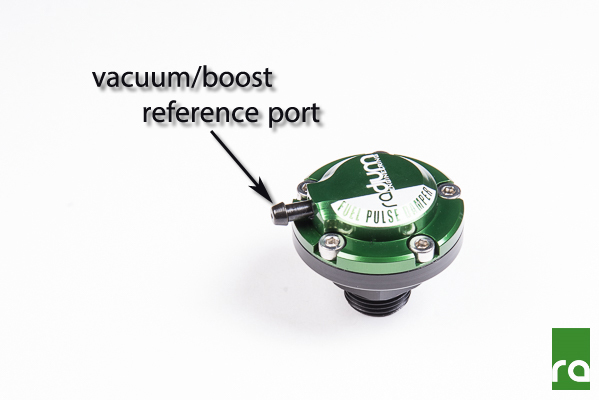 To address this issue, we have designed the first aftermarket vacuum referenced fuel pulse damper. Radium Engineering Fuel Pulse Dampers are CNC machined from aluminum, anodized, and laser engraved. They are resistant to all fuel types including alcohol blends such as E85. This new FPD design maintains full damping function throughout the range of pressures seen in the fuel system of a boosted engine with a 1:1 vacuum referenced regulator. CLICK HERE FOR THE DIRECT MOUNT FPD PRODUCT PAGE. It is true that placing the fuel pressure regulator close to the rail can help control pulsation issues in some instances. However, we often recommend dead-end fuel systems for their simplicity and reduced heat delivery to the fuel tank. When building a dead-end system with the regulator in the back of the vehicle near the fuel pump(s), the regulator is a great distance from the fuel rail. This is a situation where the tuner can benefit from a pulse damper mounted on, or near, the fuel rail. Even with the pressure regulator very close, or directly mounted to the fuel rail, damping can be improved and certain situations will demand an FPD to be used. We are introducing a pair of new universal direct-mount fuel pulse dampers, the FPD-R and FPD-XR. 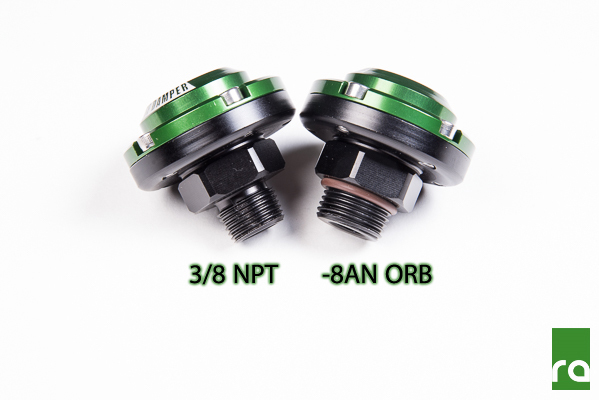 Each unit comes with different thread options: 3/8NPT or 8AN ORB. These can be mounted to a fuel rail port that has the proper mating female threads. Check your fuel rail for compatibility. For situations that do not allow mounting of the damper directly to the fuel rail, Radium has also released a version of the dampers for mounting in-line with the fuel delivery line near the fuel rail. 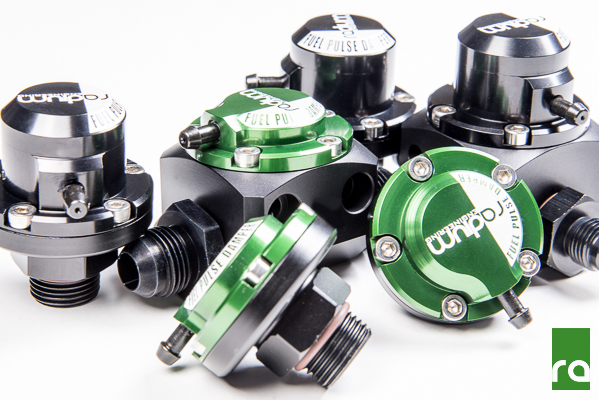 The body of the damper features 8AN ORB female ports (3/4-16 O-ring) which accept a wide variety of common adapter fittings. FPD-XR In-Line version. Available with different -AN adapter fittings. Which one do I need, FPD-R or FPD-XR? The smaller FPD-R is a compact version designed to fit into tight spaces. The only compromise being that it is calibrated for use with 40 to 70 psi base (static) fuel pressure only. If your base fuel pressure is higher than 70 psi, then the larger FPD-XR should be used, which permits base pressures between 40 and 120 psi. More details HERE on the product page. It is imperative that the correct damper is chosen. Email info@radiumauto.com if assistance is needed. 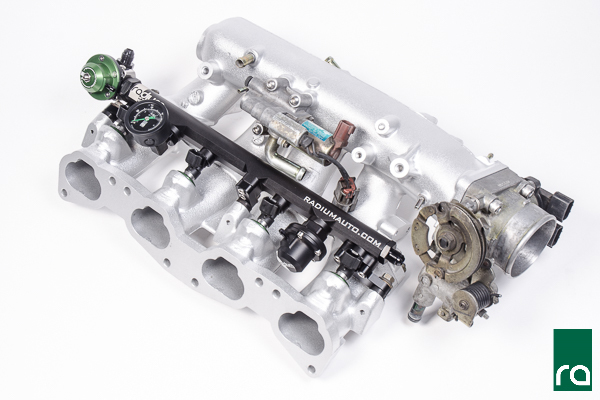 Important note for boosted applications: In order for the FPD to work properly, it must be pressure referenced to the intake manifold, preferably from the same vacuum line that the fuel pressure regulator uses. If the fuel pressure regulator on the engine is NOT vacuum referenced, then do not hook up the vacuum referencing on the FPD. 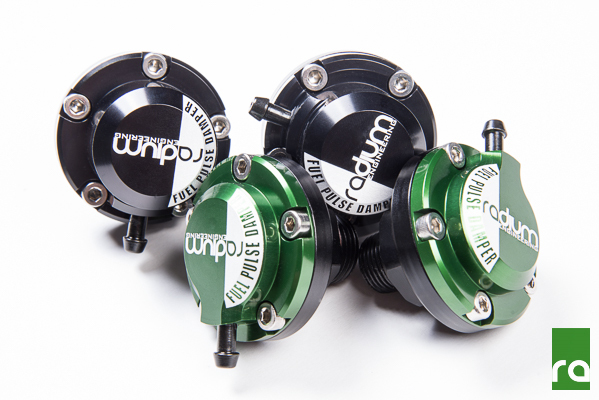 Fuel Pulse Dampers are available now through radiumauto.com and any Radium Engineering Authorized Dealer.